Your participation has been a great help and has allowed us to take the first look at some of the spatial differences between autocomplete. Click on the image below to get a bigger image of some the results so far. The cells in yellow are ones that stand out as different/interesting. The U.S. remains very focused on the 50 year old events of the Cuban missile crisis while other places are clearly not. We're particularly amused that Cuba Gooding Jr. is the top result in Hong Kong. While we feel a bit bad for the country of Israel we can't help but love the fact that Israel Kamakawiwo'ole seems to be the top ranked result for the keyword "Israel" the world over. We also suspect that Macau is likely not thrilled with its association with Macaulay Culkin, although the results for Hong Kong (ferry) show that proximity can win out over celebrity. The connection between Kazakhstan and adoption in the U.S. and Canada is interesting as we've previous discussed. The India, Canada, Nicaragua and Hong Kong results are all good examples of localization in search results. We encourage all of you to help us continue to flesh out our Autocomplete map of the world by contributing your own search results using Autocomplete. If you follow the link you will find an open spreadsheet to record the results. But before you do, please follow the steps below to make sure that your results are not being affected by your own search patterns. Be sure to be signed out of your Google Account while you search on Google. If you are signed in to your Google Account, your search experience may be customized based on your own personal past searches (which would no doubt be fascinating to your friends and family) but is NOT what we're after. Learn how to turn off these customizations. Remove particular searches from your Web History at www.google.com/history, or by clicking the "Remove" links that appear beside personalized predictions. Remove Web History from your Google Account. Type the country name without a space at the end. If you're curious, compare how "Australia" and "Australia " (notice the space) give different results. Copy the FIRST search term that comes up in to the online spreadsheet. There are 250 or so countries names in total. If you can't do all of those, we've prioritized the top 150 for you to complete. We're primarily interested in people outside of the US and the UK but we'll take anyone's help, no matter where they are. Also we're limiting ourselves to the English name of countries for now. Building on the recent fascination with the United States of Autocomplete map, we thought we'd expand its premise to look at the entire world. In short, we'd type the name of every country into Google and record the top ranked autocomplete, i.e., Google's guess on what you are looking for. Once we started working, it quickly became apparent that the results we were getting in the U.S. sometimes differed dramatically from the results we found in the United Kingdom. Suddenly what had been a simple mapping exercise became an exciting means of better understanding the geographic differences in search patterns. Cool! You gotta love it when stuff like that happens. Because it's hard to fit so much data in a static map, we've created a mashup that you can download as a KMZ file and view in Google Earth. (By the way, we hope you like the iconography. We've been looking for a good excuse to use it). As the map is a bit complicated a few words of explanation. We used a list of countries maintained by the CIA World Factbook. Obviously this exercise can be replicated with any other list of place names. 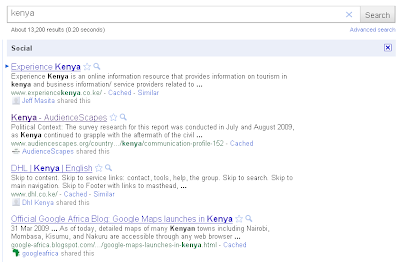 We conducted the searches in January 2011. The icons are generally centered over the capital city of a country. The blue icons represent the autocomplete results obtained in the U.S. (specifically Lexington, KY) and the red icons (offset a bit for readability) represent the results from Oxford, UK. 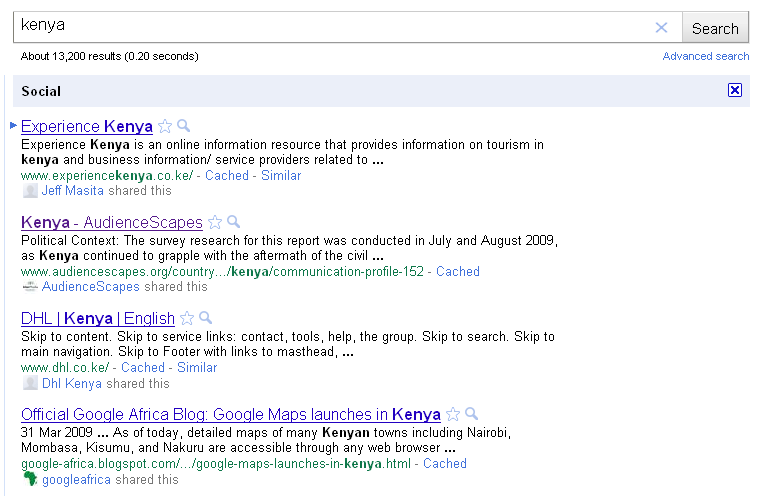 The label for each icon contains the search term, the location of the search and the top ranked autocomplete result. For example, the label "India (UK): indian visa" indicates that the first autocomplete entry in Oxford was "Indian visa". Take it out for a spin and see what you find. What we've noticed from this exercise is that the location of the searcher clearly matters. We're not exactly sure how Google decides what other searches to include in its autocomplete (nor do we think they will tell us) the differences in our results provide some clues. Google autocomplete is incorporating geocoded data. The best example of this is that in Lexington searches on terms China and Nicaragua return "China Star Lexington KY" and "Nicaraguan Grill Lexington KY"; two local restaurants in the city (by the way, the Nicaraguan Grill makes a great Nacatamale). This same geocoded effect does not show up in Oxford but the Lexington results show that there is a blending of regular search and spatial search. Second, the autocomplete suggestions appear to be shaped (in part) on the makeup of other user searches in geographic proximity. The example of the restaurants above support this idea as well as does the results for India in the U.K. and U.S. Whereas, "indian visa" is the first suggestion in the U.K. (reflecting the long colonial and migration connections) the first suggestion in Lexington is "Indianapolis Colts", a football team based only a few hundred miles away. Likewise a search for Panama in Lexington results in "Panama City Beach" (located in Florida) rather than "canal" as found in the U.K.
Third, and perhaps most intriguing, is the way these differences illuminate the varying ways in which countries are conceived of (at least in terms of search queries) in separate locations. For example, in Lexington, both Kazakhstan and Bulgaria generate the suggestion of "adoption" (decidedly different that the U.K. results) perhaps linking these countries in the minds of near-Lexington based searchers with international adoption. While these countries are not the largest source of adopted children (China and Russia are 1 and 2) Bulgaria and Kazakhstan (in particular) are connected to the U.S. via adoption and moreover are less likely to have other competing searches. Hence adoption is the first suggestion. In a similar vein, a search for " British Indian Ocean Territory" in Lexington suggests "flag" while in Oxford "holiday" is the top result. There is also a clear element of temporal closeness. The search for North Korea results in "bombs South Korea" which was an important news story during our searches. It is also clear that correctly interpreting a user's intent based on limited input remains a challenge. A search for Turkey results in the suggestions of "brine" and "cooking time". Finally it seems that autocomplete suggestions are susceptible to spamming efforts the strong presence of commercial/business representations online. For example, "tractor parts" is the top result for a search on the term Belarus in Oxford most likely because the domain Belarus.com is for tractor manufacturer. Again, the low level of Belarusian references online is likely also contributing to this. While these results are really enlightening getting a larger sample of searches from a range of locations is important to help explore this phenomenon. And this is where you dear reader come in. Stay tuned for the next post when we work on crowdsourcing the geography of autocomplete. We've written a fair amount about the geographic and linguistic clusters of Wikipedia authors but were reminded today (via New York Times "Room for Debate" forum") that there are plenty of other clusters along social and economic dimensions. Last year a survey of Wikipedia users was conducted which highlights some interesting fissures within the user group. What was the sampling method used? Nothing is listed in the reports. What is the bias in the sample? For example, Russia and Russian speakers are the largest language and country groups represented in the survey even though the Russian section of Wikipedia is only the 8th largest linguistic group. (English, German, French, Italian, Polish, Japanese and Spanish are all larger). Did women have a lower participation rate then men in the survey? There were three times as many male respondents as female respondents. Does this accurately reflect the makeup of the Wikipedia audience? Given the unexpected results for language and country, it is not clear if there might be gender bias as well. All this said, we find the question of an imbalance in gender participation very intriguing and important. We just don't know if the survey methods used are such that we can be confident in the magnitude of the highlighted differences. Anyone who can shed some light on this would be more than welcome to comment. Today's launch of police.uk by the Home Office provides the highest resolution mapping of crime data available in the UK to date. 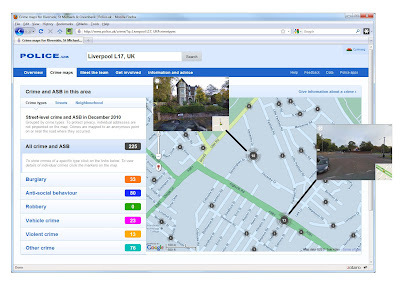 The website supports searches at the level of unit postcode (similar to a zip code) and returns results mapped at the street level. In previous UK crime maps these have typically focused on area aggregations using administrative or census geography (e.g., the London MET Police website). However, this new website appears to place points on maps at locations of where crimes have occurred... or does it? I will not argue here for the general merits of releasing crime data to the public in , or what does or should constitute a “crime”, nor those problems with how these events are recorded and georeferenced. Far better treatment of these issues is given by my PhD student Paul Richards over on his blog. However, there appear to be some serious representational issues in this new mapping system which are not clearly documented and could be very misleading for the ill informed. Very generally, crimes will typically happen at a specific location, for example, a house could be burgled, or a person mugged. Ideally, this location would be represented as a point on a map where the event was recorded as happening. In a US equivalent system (e.g. http://chicago.everyblock.com/) it is entirely possible to map these very precise locations as there are different privacy laws related to the disclosure of these sensitive data. However, in the UK, law requires more aggregate representations to be used, such as areas, and most typically being represented as choropleths. For example, you could show the frequency of burglaries or muggings that have occurred in a specific area. Although the documentation on launch was scant, it appears that the locations of crimes have been linked and aggregated by their nearest road segment, and that these have then been subsequently displayed as a point on the map. It is unclear whether this point is a randomly chosen along the road, or, whether this is the centroid of the street segment. Either way, it is a very poor representation of the data. Outside of issues related to how you appropriately position a point for very long road, if the street is going to be the aggregating unit for the data, then this should also be used for the visualization. For example, roads could have been variably colored for different rates of crime (rates not counts... this is another representation issue entirely!!). Systems are not a limitation here, using the combination of OpenStreetMap, Mapnik and OpenLayers it is entirely possible to build customized and bespoke online cartography. We do not have to rely on putting points on maps any more as our only representational option. The problem with this website as it stands is that crimes are easily misinterpreted as happening at a very specific locations. If your house happens to be located next to one of these points it may suddenly appear to an uninformed user that there is a lot of crime in this specific area. For example, perhaps public order offensives related to a pub on a street are returned as occurring at a residential location. How might this effect a house price? Would household insurance rise? These basic representational issues are typically covered in an undergraduate syllabus with a GIS component. To me at least this perfectly illustrates why Geography and GIS training is as important as raw technical skills when developing online mapping portals. This type of issue will not go away as these types of website become more prevalent as the open data movement grows; and more typically this are built by or without consultation with Geographers. One year ago today, the wonders of America's Beer Belly, as discovered by the Floatingsheep Collective, were announced to the world-at-large. By far the most popular single post in our relatively short history, the Beer Belly of America was eventually featured everywhere from The New York Times and Andrew Sullivan's blog on The Atlantic to Strange Maps, FlowingData and the Consumerist. 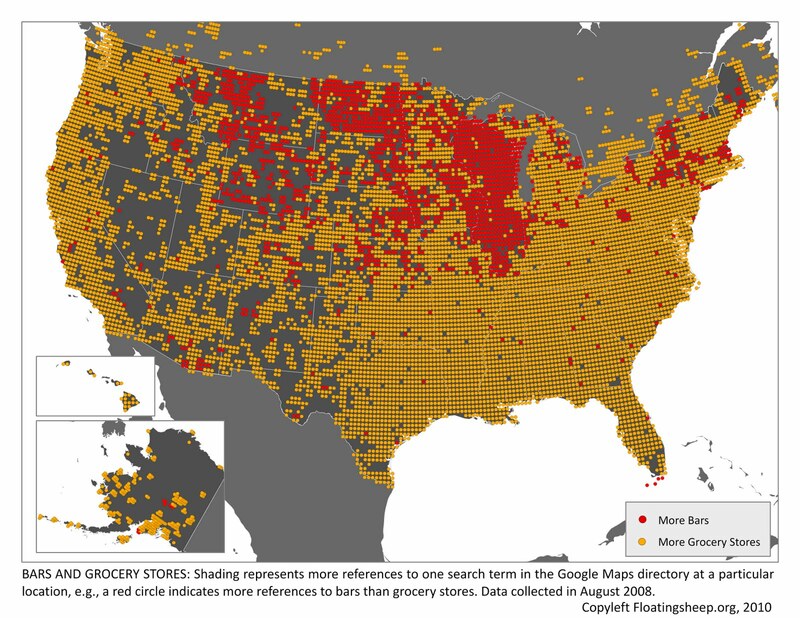 Our extrapolation that the prevalence of bars as compared to grocery stores in the American upper Midwest (using directory listings from Google Maps) was indicative of some cultural characteristic may or may not have been especially daring. But one thing is clear: in addition to the official statistics from the Census Bureau, the innumerable comments generated on this blog and many others served as corroboration for our claims. Whether it took us 'discovering' it, or just giving it a name, we now know that Wisconsin, Illinois and much of the Great Plains are the true Beer Belly of America.